5 1/4 (6 1/4, 7 1/4, 8 1/4, 9 1/4, 10 1/4)" hand circumference. Mittens shown measure 8 1/4". 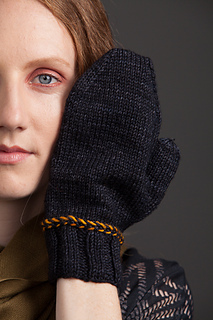 Sized for the whole family, the Phoenix Mittens feature a simple two-round braid at cuff and gusseted thumb. Finished Sizes 5¼ (6¼, 7¼, 8¼, 9¼, 10¼)“ hand circumference. 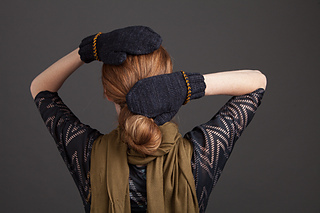 Mittens shown measure 8¼”. Yarn Madelinetosh DK (100% superwash merino wool; 225 yd [206 m]/3½ oz 100 g): thunderstorm (MC) and gilded (CC), 1 skein each. Gauge 24 sts and 32 rows = 4” in St st.